A bed and breakfast waiting to be born? This article is bound to be controversial, but the author raises an important point when she notes that the entire "war" (such a sad metaphor) over the future of Christianity does not boil down to the sum of church property battles. "a great orator but a lousy convincer"
Not my words, but those of Steffen Schmidt, poli. sci. prof at Iowa State U. That is a very interesting take, by the way, for several reasons, but not so much because Iowa is the land of the coveted caucuses. Rather, it is interesting for the fact that rhetoric (what orators are supposed to be good at) is classically defined as "the art of persuasion." Since convincing and persuading are essentially identical, what Schmidt seems to be saying is that the great orator in question is in fact lousy at what orators are supposed to be good at. So if the governing isn't there, and the great orator myth is showing itself to be the disappearing vapor that it is, that doesn't leave much. In honor of National Poetry Month (April), see my exchange with Ashley Ormon, editor of Proverbs and Wisdom, and author of God in Your Morning. 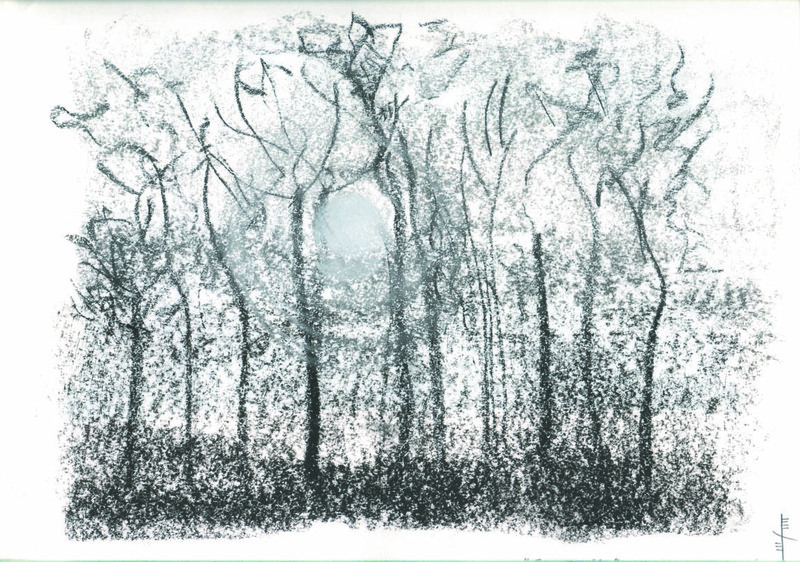 Our discussion of poetry and of my little book, The Just Quiet Wind, continues in her print magazine, In the Light. 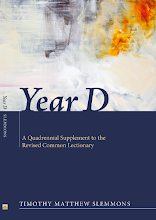 Order a copy to support this winsome and avid advocate for Christian poets and writers. Reading Joshua 22 this morning, I ran across this phrase rendered "to/in the region" (vv. 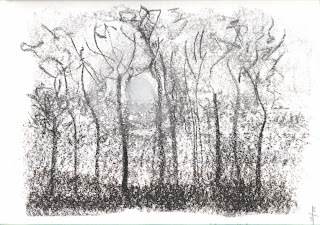 10, 11; NRSV). The Hebrew is alternatively (and more literally) rendered, "to/at Geliloth," which bears a remarkable similarity to "Galilee." The one thing that would suggest perhaps not is that this structure appears round, rather than square or rectangular, as would be appropriate if it were a "copy" of the original at Shiloh (v. 28), but that could be a matter of entropy over time. Meanwhile, note that Geliloth means "stone circles" (Hastings, ed., Dictionary of the Bible) and is also translated "borders" or "coasts." While Geliloth is often identified with Gilgal, there seems to be some debate on that score. I know, Galilee is a long way from Adummim (cf. Josh 15:7; 18:17), but if "Geliloth" is used here in a more generic (coastal, regional, circular) sense, I suppose it is just possible. Make sure to follow the links to the image gallery, esp. the map inset. Then see again the latter half of v. 11, which says they "built an altar at the frontier of the land of Canaan, in the region (Geliloth) near the Jordan, on the side that belongs to the Israelites." Depending on what map you consult, "Canaan" and "Gilead" (where the confrontation with Phineas took place; see v. 15) often stretch as far north as Galilee. Just wanted to call your attention to the FB link at right to the product page for Liturgical Elements for Reformed Worship. 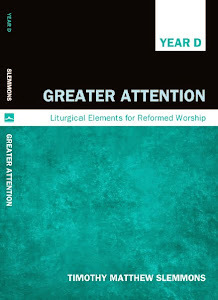 Greater Attention (for Year D) will soon be out (looks like a couple of weeks yet), and The Joyful Feast (for Year C) later this year. As I said to someone the other day, if I were a surfer, I would be the guy who just missed the big one. Meanwhile, I hope you "like" the product page and "share" the word on this new (expansive) series of resources. This is Track 9 on A Soundtrack for the Close of the Age (1991), and the final track on that album before Track 10, Imago Dei, was added a few years later. The title means "little song." According to Gallup, Iowa is the fourth least stressed state in the union, and the least stressed non-southern, non-Pacific island state. I can see why MA would be stressed, but what's going on in UT? Um, ... no. This brings to mind that scene in Dickens' A Christmas Carol where the two "ghastly" children are seen huddling under the robe of the Ghost of Christmas Yet to Come, and Scrooge is warned that, of the two: Ignorance and Want, the former is the worse. And now we have seen and can recognize Ignorance by its fruit. With all the buzz in the media (old and new) regarding the hunt for the Boston bombers, I am reminded of the petition that I tend to pray in such situations, that is, when someone who is clearly armed, dangerous, and possibly desperate is being sought. It comes down to praying Christianly (responsibly, but without a thirst for vengeance) for one's enemies, that is, those who are a menace to society and who may yet to further harm. The prayer comes down to five verbs. Once those are done and the danger is averted, one can work out how best to pray on a case by case basis (for repentance, for rehabilitation, for regeneration, or for justice to take its course). But in the moment of crisis, as after 9/11, or on other such occasions when a killer is on the loose, I find this is a prayer that can be offered with a clear conscience and a level head. "Dear Lord, may the perpetrators of the Boston bombings be exposed, detected, apprehended, disarmed, and restrained, in Jesus' name. Amen." Please excuse this thoroughly extra-curricular post. But I was discussing our recent purchase of a new vacuum cleaner with a young man who used to handle complaints for a major vacuum brand. He asked what we bought, so I told him. We got the Shark Rotator Pro. After consulting Consumer Reports and reading a lot of customer reviews around the web, we decided on the brand by calculating what I call "the lemon factor" based on what I think are statistically significant Amazon reviews, dividing the number of 1-star reviews by the total number of reviews. Various models of Shark's popular Lift-Away series came up with a lemon factor of around 5% or less, while other brands were consistently upwards of 7 to 8% and sometimes over 10%. When it came to the specific model, there were not so many reviews to go by, but we looked at the Rotator Pro in the store, liked the weight, the size, the price, etc., and took the plunge. It came out of the box and assembled in a refreshingly simple way; a quick once around the living room and I think we've got a winner. A winner, that is, to go with this winner, who helps us produce record amounts of fluff and stuff. Here's my author page. I hope you "Like" it. I must say, it has been inspiring to see how many earnest prayers have been lifted up for those who are suffering in Boston as a result of the recent murderous attacks. But "up" is precisely my point. As often as I have seen tenderhearted, well-meaning, compassionate prayers from trained pastors and others who know "which way is up" when it comes to prayer, I read or hear of many others, usually in the political sphere or in PR positions, who say things like: "Our (thoughts and) prayers go out to (!) the victims and their families." While it is perfectly acceptable to direct one's thoughts to someone in need, how did we ever come by this non-sensical notion that we direct our prayers to them? That's like asking a favor of someone who is in pain, shock, or comatose. Why can't we summon the clarity and the courage to say, "We think of the victims and their families at this time, and pray to God (!) for their comfort and healing." While I am certainly willing to entertain the notion that "our prayers go out to" can mean "are offered on behalf of," I just don't see that such words of comfort are really all that comforting when they are couched in such a way as to suggest that God is cut out of the equation. Moreover, I don't see how allowing our generic references to God can be terribly reassuring without making it clear that the God whom we are addressing and of whom we are seeking help is the crucified God-man, Jesus Christ, who alone can redeem human suffering and promise eternal life. All the wise sages, the pantheon of fakers, and the watchmaker gods don't cut it. Pastors can model a proper understanding and practice of intercession in Jesus' name, but if those who offer such comfort in public are not themselves schooled in prayer and perhaps don't attend public worship regularly or pay attention to good models, well, it is little wonder that public theology and the nation itself are in such a dilapidated state. In the Series Foreword to Liturgical Elements for Reformed Worship, I explain that the Reformed tradition views the corporate Prayer of Confession is not limited to the confession of personal sins or even the sins of the church, though it certainly includes both. More broadly, it is a confession of the sin of the whole world, a continuation of Jesus' own intercession on the cross in which he says, "Father, forgive them for they know not what they do." In that spirit, then, let me offer this Prayer of Confession from When Heaven Stands Open, not because any person of genuine faith could have had a hand in the mayhem in Boston, but so that we might recognize and confess the sickness of whole human race, honor those who are suffering, direct our thoughts to the redeeming suffering of Christ, and cry out for healing. And to those who do not see the sense of such prayer, and even to those who would scorn it and thus demonstrate that do not know what they are doing, let me simply say, "In the name of Jesus Christ, you are welcome anyway." Merciful God, with tears and cries you offered yourself for our release, yet our pettiness perpetuates grief and suffering. Forgive us, O Christ, for failing to recognize you in those we hurt or tear apart. Forgive us for holding ourselves and each other hostage in judgment, anger, contempt, and criticism. May your Spirit flow through us once again. Anyone who wants to understand how the ecclesial earthworks have shifted over the last hundred-plus years needs to read my colleague Elesha J. Coffman's new study of The Christian Century and the Rise of the Protestant Mainline (Oxford University Press). Meanwhile, her recent article over at The Huffington Post is a good entrée to her important and revealing work. Thanks to the Presbyterian Outlook for linking to this interview with Kirsten Powers. It's very refreshing, not because I agree with everything she says; in fact, I disagree with a lot that she has to say. But — whether I agree or disagree — I found her responses surprising on almost every question. Where I thought she would attack she defended and where I though she would defend she critiqued. Just goes to show how little the labels "evangelical," "Democrat," "Alaskan," "Fox-news contributor," etc., convey anything. Perhaps there is hope for the individual after all! more of you, more of you, in my (our/your) world. It was free where I got it. Feel free to share! I have a heard a lot of bad things about the budget being proposed in Washington, but this is the worst. As great as this idea is, if it were implemented, I can easily foresee both parties shifting directly into managing expectations. Meanwhile, I wonder which party would lose the most seats in Washington: the one that openly laments being "the stupid party" or the one that is so cocksure it is not? Tough call! Study an issue before you try to reform it. This should apply, whatever your stance, pro or con. What? Another book on heaven? Well, yes! Here's a handy flier from the publisher of my LERW series, with description, blurbs, and contact information for anyone who would like to request a review copy. Feel free to print, display, and share. Meanwhile, paperback and/or e-book copies can be ordered here. "... one of the most undercovered stories in international news." This from Kirsten Powers. Please share, pray, ... and if you are up to it, ... picket! Ever wonder why the church is just as politically bifurcated as the body politic? I suspect there may be many reasons, but surely one contributing factor must be the fact that among all biblical texts that caution against turning "either to the right or to the left," not one of them (!) is included in the Revised Common Lectionary. Below is what I think is a comprehensive list. I am not counting the phrase as uttered by Abraham's servant (Gen 24:29), since there is no moral or political implication attached to it, or as it used of Asahel's pursuit of Abner (2Sam 2:19), the angel blocking Balaam's path (Num 22:26), or the milk cows returning with the ark from Gaza (1Sam 6:12), since these are purely non-evaluative descriptions. But only the Genesis passage occurs in RCL, anyway. Certainly Moses hopes the Kings of Edom and Heshbon will view in a positive light his promise that Israel will pass through their land by a straight, unswerving course (Num 20:17; Deut 2:26-27), though in each case his request is rejected. You must carry out fully the law that they interpret for you or the ruling that they announce to you; do not turn aside from the decision that they announce to you, either to the right or to the left. It (a copy of the law) shall remain with him (the future king) and he shall read in it all the days of his life, so that he may learn to fear the LORD his God, diligently observing all the words of this law and these statutes, 20 neither exalting himself above other members of the community nor turning aside from the commandment, either to the right or to the left, so that he and his descendants may reign long over his kingdom in Israel. The LORD will make you the head, and not the tail; you shall be only at the top, and not at the bottom—if you obey the commandments of the LORD your God, which I am commanding you today, by diligently observing them, 14 and if you do not turn aside from any of the words that I am commanding you today, either to the right or to the left, following other gods to serve them. Only be strong and very courageous, being careful to act in accordance with all the law that my servant Moses commanded you; do not turn from it to the right hand or to the left, so that you may be successful wherever you go. Therefore be very steadfast to observe and do all that is written in the book of the law of Moses, turning aside from it neither to the right nor to the left, 7 so that you may not be mixed with these nations left here among you, or make mention of the names of their gods, or swear by them, or serve them, or bow yourselves down to them, 8 but hold fast to the LORD your God, as you have done to this day. He (Josiah) did what was right in the sight of the LORD, and walked in all the way of his father David; he did not turn aside to the right or to the left. He (Josiah, again) did what was right in the sight of the LORD, and walked in the ways of his ancestor David; he did not turn aside to the right or to the left. Wherever your edge is directed. But lest you think scripture is always and absolutely perfectly "fair and balanced," Ecclesiastes offers up this startling text that exemplifies what the late James E. Loder would call an "asymmetrical bipolar relation," with the emphasis in this case on the asymmetry. As far as the church goes, I think the oddity of Ecclesiastes can best be understood by bearing in mind two things: (1) the church as the body of Christ is a bi-ped, and we should not aspire to try and force it to be anything but that (see 1Cor 12); and (2) the body of Christ, though a bi-ped, is not perfectly ambidextrous or balanced; to employ a baseball analogy, though the church may well be a switch-hitter, and a good one at that, her batting average is marginally better on the right. Whether or not you agree with this conclusion regarding this asymmetrical characteristic, I say, let the emphasis fall on unswerving obedience. Let the church exchange her political biases for — no, not a middle-of-the-road lukewarmness (Rev. 3:16) or "third way" theologies, as if Jesus were not "the Way" — but to single-minded obedience to "the Way" of Jesus Christ and wholehearted adherence to the straight and narrow. Such obedience, of course, takes equal parts truth and love (2Jn 3). As I've mentioned before in both Groans of the Spirit and Year D, the exclusion of Jesus' sayings regarding the narrow gate from the RCL are inexplicable and ultimately perilous. Now, as we see the pattern whereby the RCL also excludes all warnings (!) against veering either to the right or to the left (but especially to the left), perhaps we can come to recognize the sense in which the political biases of the church have been exacerbated as a result of this exclusion, and come to a new point of resolution as well, namely, to show the world what true discipleship — following Jesus with the obedience of faith (Rom 1:5; 16:26) — actually looks like. Turn off the talking heads, all of them, and fix your eyes upon Jesus. 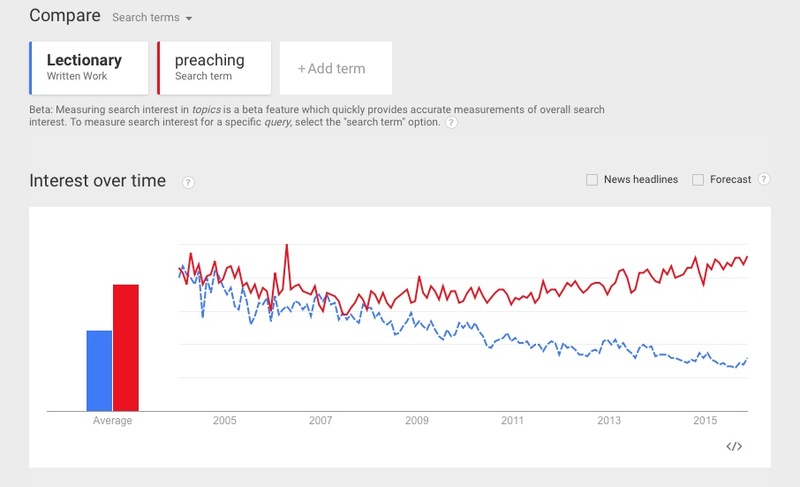 And, where your preaching program is concerned, perhaps it would be a good idea to reclaim the texts mentioned above (not just those mentioned in Year D) and make them the focus of sermons, weave them into your intertextual references, craft them into your function statements, incorporate them in the liturgy and the language of the church. The author of this article seems more open to them — in writing, please note — than I think advisable in preaching. Thus, I normally (and strongly) caution my students against using them from the pulpit, mostly because the ear does not pick them up very readily, especially the ears of the elderly. But I certainly agree: they are irritating! ... but I just can't put my finger on it. As for all the competing carbon dating results regarding the Shroud of Turin's authenticity, it has always seemed to me that any good cop — OK, any qualified forensic pathologist — could spot the matching blood stains on the Sudarium of Oveido and put two and two together. Here's an object lesson in how to sabotage Christian unity from the pulpit while sucking up to the powers that be. Even if you agree with the preacher, this sort of homiletical scatter shot is not the way to go about making your point. UPDATE: Actually, I think The Kid President does a much better job of unifying people, even if his pep talk (h/t Dan Mayes) is not technically a sermon. A FURTHER UPDATE: Krauthammer articulates it pretty well here. And as for the admittedly flippant title of this post, let me simply remark that there is a big difference between stewardship and salvation.